When we released our first pajama pattern, early in the life of Oliver + S, we had no idea how popular it would be. I wasn’t familiar with the tradition of making and giving pajamas for Christmas. But it makes a lot of sense: not only do pajamas make a thoughtful and cozy gift , but they look great for gift-opening photos on Christmas morning. 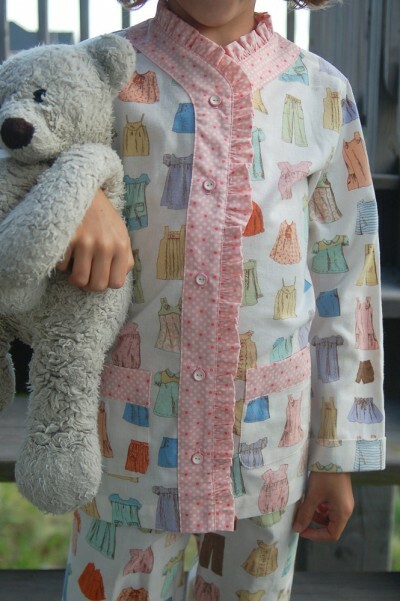 The Sleepover Pajamas are our newest pajama pattern, designed in response to your requests for larger sizes (now that all our patterns go up to size 12) and because many of you wanted button or snap fastenings. 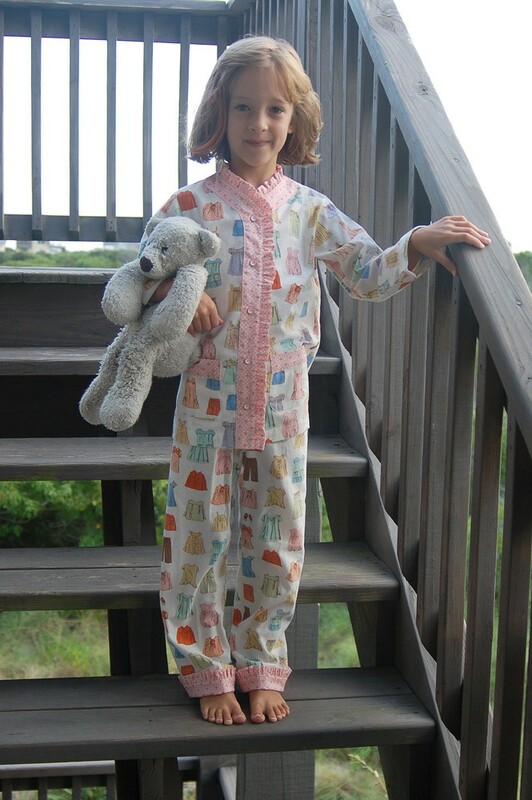 And hey, it just seemed like time for another pajama pattern! 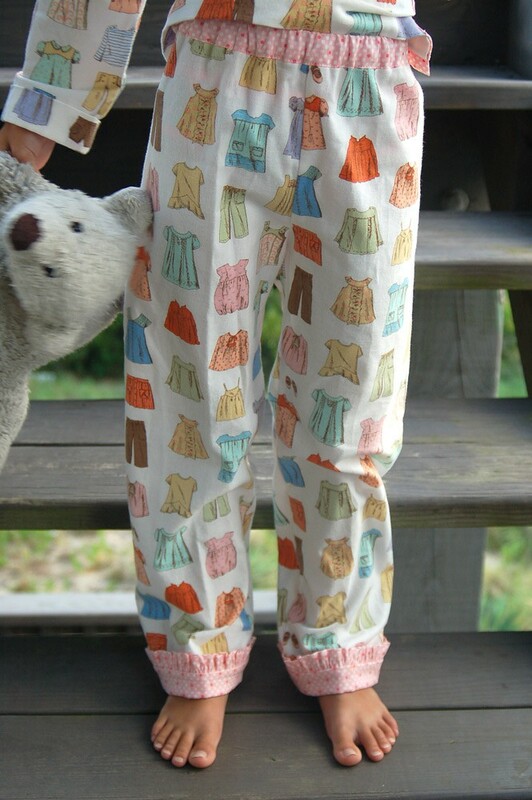 I’ve made countless numbers of the Bedtime Story Pajamas for S, and we were both ready for a new style. As always, the details are what make them so fun. The style itself was inspired by vintage baseball jerseys. The pattern features a contrast fabric external facing that forms the button placket which is very easy to make and finishes the neckline all in one go. Many of you will be happy to see that there are no fiddly collars for this style. The pockets match the styling, with a contrast hem at the top edge. 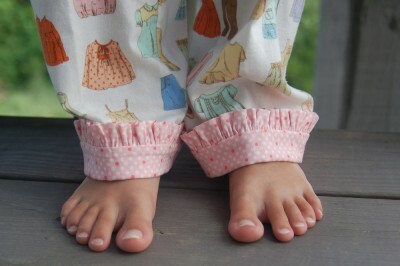 You’ll notice that the sleeves and the pants both have cuffs that are designed to be unfolded so the pajamas can be worn longer. The old adage that children grow up before they grow out certainly seems to hold true, so you’ll get extended wear out of the pajamas this way. I’ve been showing you version B of this pattern, with all the feminine little ruffle details. 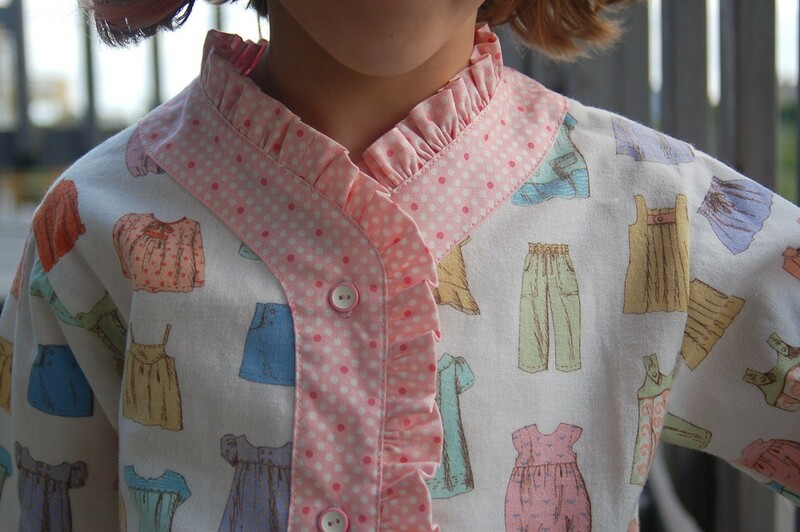 This view takes longer to sew (ruffles, while sweet, also command a little extra effort to make), but the payoff is really high.You could also use ruffled trim here instead of making the ruffles yourself. I’ll talk more about ruffled trims very soon. View A, without the ruffles, is appropriate for both boys and for girls. This pattern, along with our other new styles, will be available here and at our retailers beginning in early September. 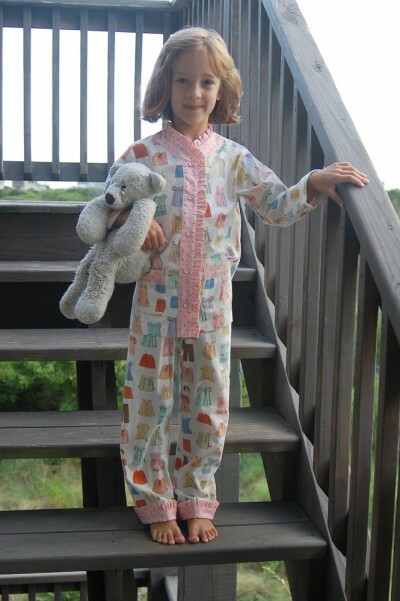 Watch the blog for an announcement about when the patterns are available. These are darling! I love the fabric you used on the pajamas for S. Could you tell me what it’s called/where it’s from? Kaitlyn, that’s the brushed cotton from Liesl’s next fabric collection, Cape Ann, which will be released by Moda in October. We’ll have more information available about the line here as we get close to the release date. I love that S is still carrying her bear. These are at the top of my “must make as soon as they come out” list. I’ve got my Children at Play flannel washed and ready! Can’t wait for my pattern!